Watch the drum horses at the trooping of the colour and you'll see that they are controlled in the same manner. The drummer's hands are needed for the drumsticks of course! 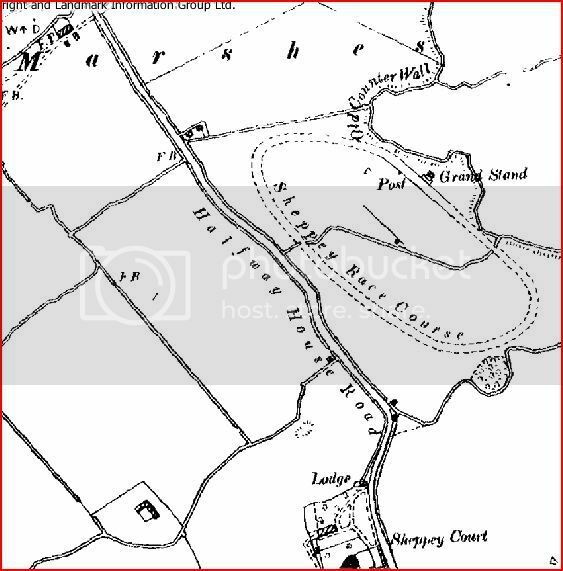 From the 25 inch to the mile OS map circa 1888- 1914 although I guess the earlier date, interesting that there is a trig point shown in the middle of the course. First meeting was on Tuesday 3rd April 1838. Final meeting Wednesday 15th July 1857. Anyone got any pics of Sheerness racecourse ??? A naval officer rode a blind horse round Sheerness racecourse without 'handling the reins, steering his steed safely by "fastening the reins to his feet. ?? ?